We've had a deluge of rain for the past 5 days, which is good as long as there isn't any flooding. However, there's been quite a bit of flooding in the Bay Area. There was even a tornado warning in South San Jose. Ok, I can deal with the earthquakes but I'd really rather not have to worry about tornadoes, too. I don't like driving in the rain, but the plus side of that is I've been a sicko since Sunday and didn't leave the house for 4 days. I finally had to go out today, despite the rain, because groceries don't magically appear in my fridge unfortunately. On a normal day I dislike grocery shopping so on a day when the weather is wet and I'm still not quite feeling right, I dread it. But I must admit that getting out of the house was nice because I was getting a bit of the cabin fever so there was a bright side to the re-stocking of our bread, milk and cheese. On Tuesday, Jimmy and I celebrated our 19th wedding anniversary. 19 on the 19th. 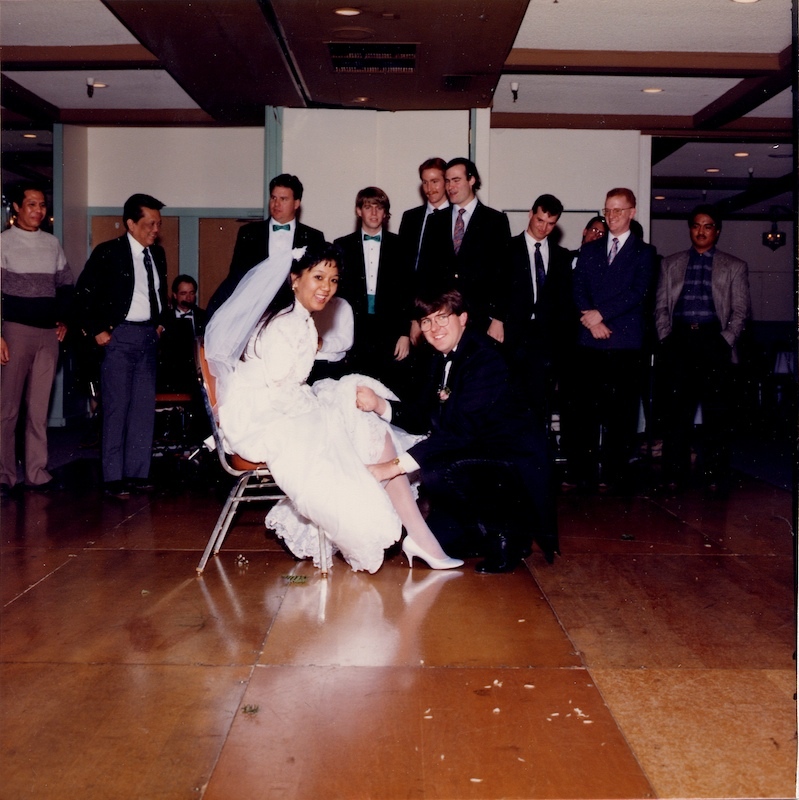 It really is hard to believe that we've been married that long. We celebrated by eating Campbell's Chicken Soup and staying in pajamas all day. We're headed to the hideaway tomorrow. We haven't been since right after Christmas and it'll be a cold snowy wonderland. 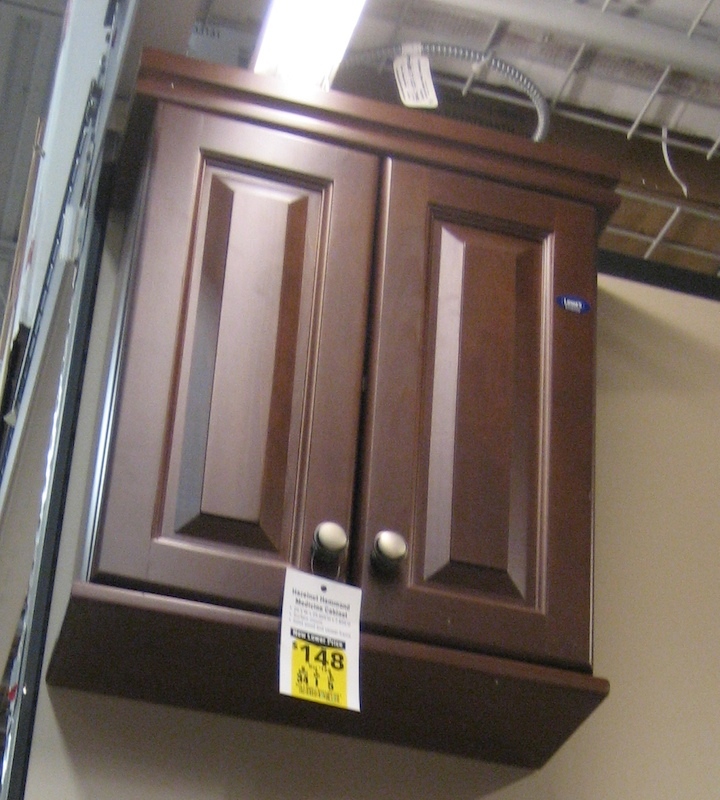 But before I got sick, we spent some time picking out stuff for the new bathroom. It was a whole lotta fun! This isn't the vanity we're picking. We were all happy with this choice, but it's going to be flush against one wall. But see how the detailing of the wood on the bottom comes out about 1/2"? That's gonna be a problem if it's against the wall. So hopefully we'll find something very similar to this that's flush. 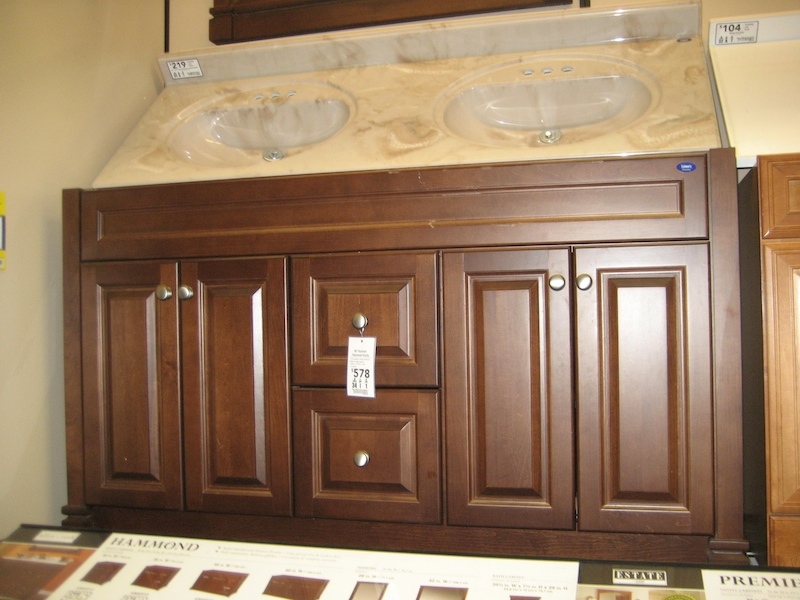 And it won't be a double sink, it'll be a smaller vanity, 36" instead of this pictured 60". And we're picking a different counter, too. 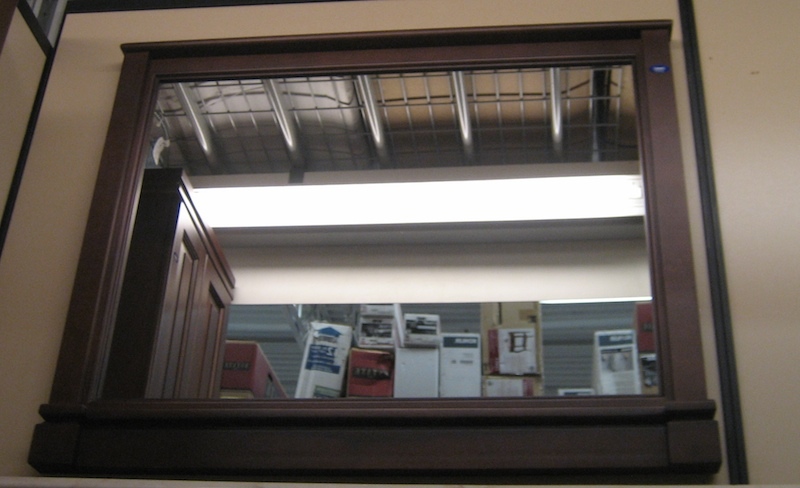 This is the mirror that matches the above vanity. Since we're not getting that vanity, we won't get this exact mirror, but it's the style we're looking for. We'll also put a little cabinet above the toilet. these bells. I lurve these bells. It's hard to tell in this photo, but there are very very subtle pink, blue and green hues in the glass. 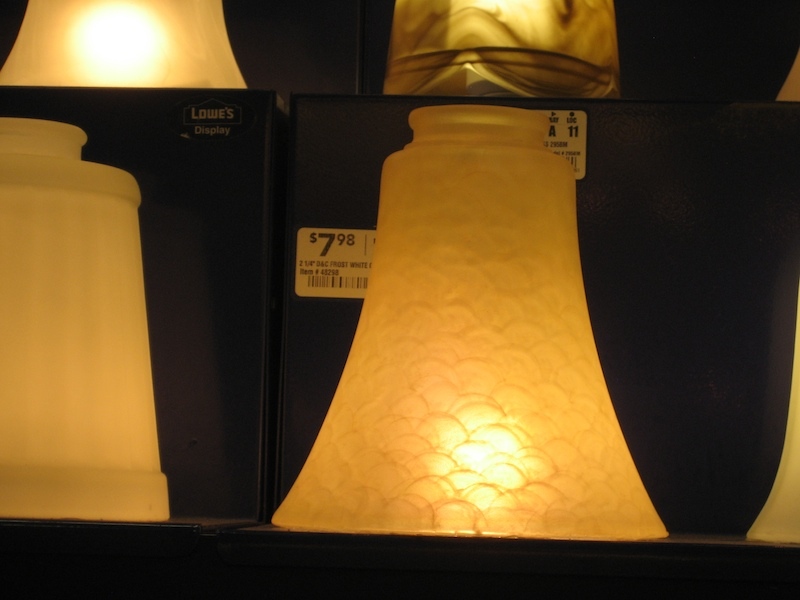 It's mostly a honey color with those cool scallops, and the different colors might not even show with the bulb, but I think it's beautiful. Jimmy was the 1st one to notice them and I fell in love with them as soon as he pointed them out. 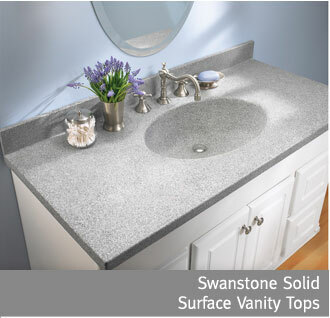 The vanity counter top will be made of Swanstone and will look like this but in a different color. We picked "Cloud White" which is mostly white with very subtle tan or off-white granite-like marbling throughout. 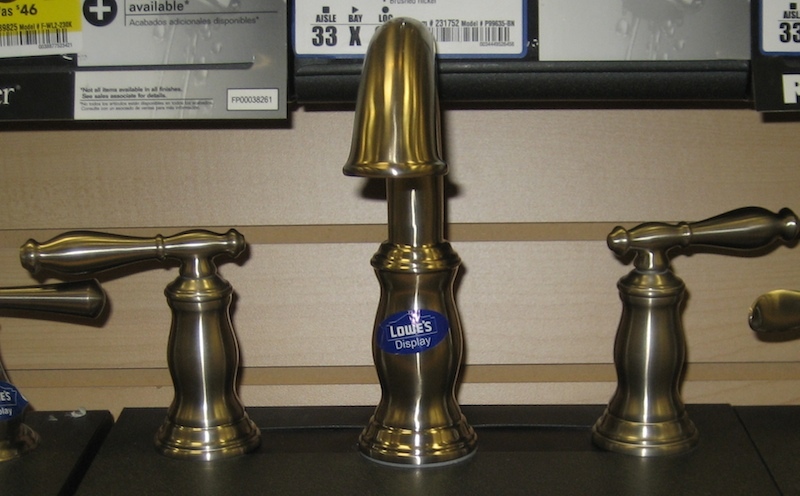 This is the vanity faucet we picked. 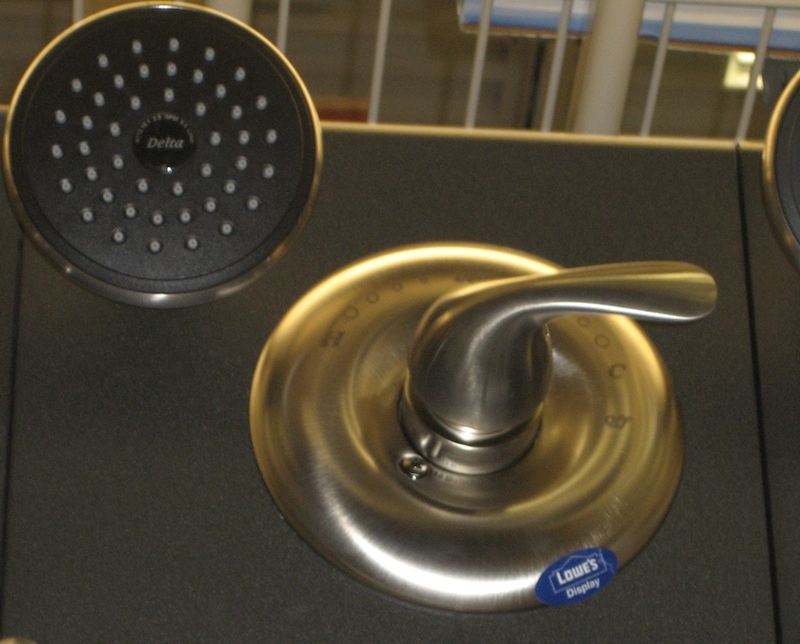 We wanted a high faucet head because it bugs both of us when we wash our hands and we hit the back of the sink. 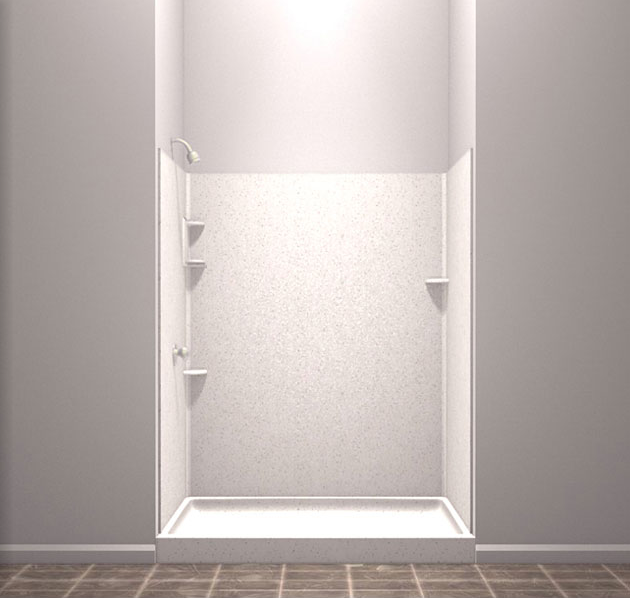 We'll have a full shower in the new bathroom and it'll also be made of Swanstone in the same Cloud White color. We haven't picked shower doors yet. But we did pick out the shower faucet. Pretty basic. We'll also add a solar tube in the new bathroom. Basically, it's a small skylight. 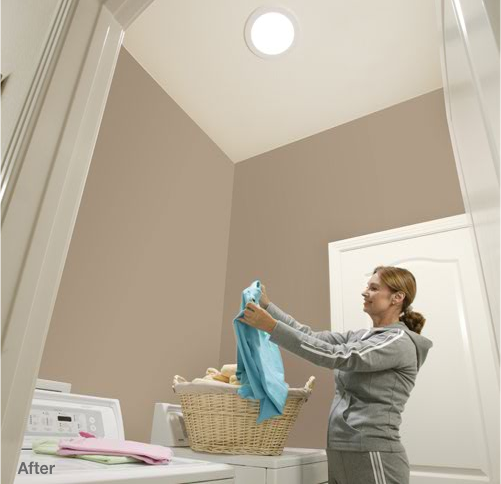 The new bathroom doesn't have a window so adding this small skylight will bring in a tiny bit of natural light in. So far, this has been the funnest part of the remodel. It's so cool to be able to design everything ourselves. I'm surprised at how easy it is. It's fun to go out with Jimmy shopping for this stuff and amazingly agreeing on everything and surprisingly not even coming close to any...um...creative arguments. lol. In other boring news, I gave in and read the 1st Twilight book. I give it an "eh." But I'm intrigued enough to want to see the 1st movie before wasting spending several hours reading the next saga. Mostly, I want to see how the movie translates how Edward is effected in the sunlight. I hope you read all that right before bedtime. I'm sure it will help you fall asleep. i'll be curious to hear your views on the movie. i watched it and then my husband, who has not read the book, watched it the next day. he called me at work and said "seriously? they...sparkle?dude...seriously?" i was not a fan. neither was he. Awwww, look at you on your wedding!! You both look so young and sweet. Our anniversarys are just a couple weeks apart. 19 years that is Ah-mazing...you both should be so proud. Oh and um..you gave my beloved Edwards an "eh"...for shame Maddy, for shame!